Make a good first impression and start your presentation off right by standing behind an elegant lectern with a professional look. Podiums and lecterns help speakers stay organized and reach audiences effectively. 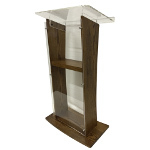 A great addition to any church, stage or classroom, our lecterns have ample room for presenter notes with shelves and cabinets for extra storage space. 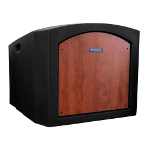 Optional sound systems helps your voice be heard over a large audience and reaches up to 20,000 square feet. Lecterns and podiums can serve a wide variety of purposes such as a church pulpit, lectern for a school, hostess stand, or a podium in a conference room. 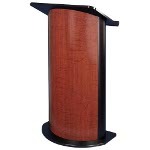 Wood Podiums - excellent for speeches and sermons Wooden podiums are the most traditional style of lectern, with its genuine wood craftsmanship found in classic and contemporary styles. 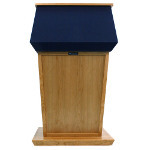 Wooden lecterns and podiums have a variety of uses such as giving speeches and presentations, or as a focal point for meeting and greeting your guests. They can serve a variety of purposes and would be great additions as a church pulpit, lectern for a school, hostess stand, or a podium in a conference room. 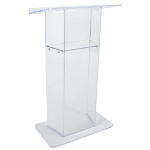 Acrylic Podiums - perfect for any modern business setting Our clear acrylic lecterns provide an unobstructed view of the presenter, adding a stylish podium to your public speaking needs. They are cut from thick acrylic sheets to prevent cracking, and joined without fasteners maintaining it stability and clearness. 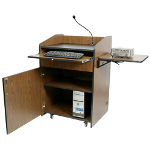 Multimedia Podiums - classrooms and multimedia presentations Fully assembled, these versatile Multimedia Work Station Carts with locking cabinet doors provide secure storage space and easy access to your audio visual equipment. 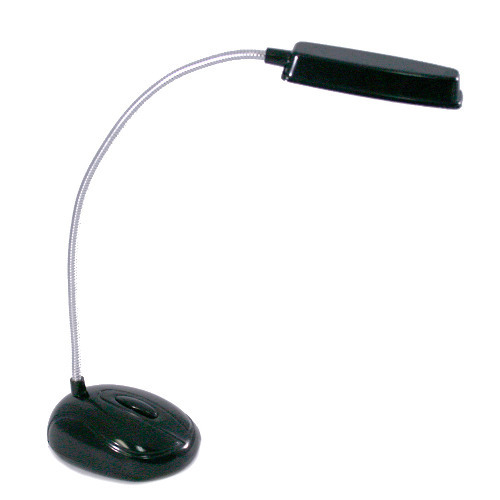 Perfect for presentations in auditorium, lecture hall, company training room, classroom, or hotel. Shelves are large enough to accommodate a document camera projector or laptop. Contemporary Podiums - focal point for greeting your guests Our elegant lecterns integrates today's contemporary design for modern décor. Its style and durability are enhanced with high quality anodized aluminum uprights, which also make this lectern extremely lightweight. The Acrylic shelf is the perfect place for your laser pointer or cup of water during your presentation. 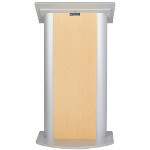 Tabletop Podiums - add a touch of professionalism to any table AmpliVox Tabletop Lecterns are the ultimate in portability, functionality, and multimedia. 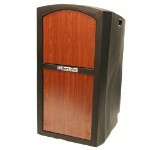 The tabletop lecterns come in SIX different materials to meet any presentation needs. 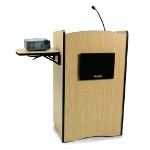 All of our tabletop lecterns can accommodate computers and projectors. Great multimedia presentation versatility. Plug your computer into our 50 watt amplifier and expand your sound.